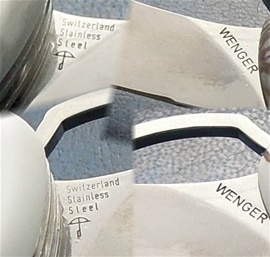 I would like to follow up some more about the very precise and accurate stamps used by Wenger. If you read sakhome.com you will find inputs around about changes and evolution on SAKs. You will find information about two Brand philosophies and the protection of them. Today it is only Victorinox and I would like to mention that this is also a Brand that have used and use very precise stamps. There is a difference like you know with the two philosophies and with Victorinox you usually get more easy to see changes done on the tang stamps. This can be small or large letters or a completely different one depending on category and designation. Wenger has also used different ones and some of them used from the 1990s and up to 2013 are so precise that it is a joy to follow. Wenger made changes and evolution factors for protecting their Brand and products by making hard to see changes. The product and knives themselves changes very much! We get the evolution on products and new introductions. If you look on the picture you can see the stampings used on the 130mm New Ranger in 2013 and it is very precise in every aspect. With tang stamps you must be aware of the depth used on them and the placing. I would express again that one must be careful by saying that some variations are done on purpose. There are the production variations on them that sometimes are unavoidable. I have no doubt that there are something with the stamp modules and design that must be done on purpose to protect them and act as a signature the same. So why go so into the aspect with tang stamps or the hard to see changes when it is no problem in history to sort out fake products and that the fakes are not good at all? I cannot rule out that there are collectability out there just because of the small changes. It is in my opinion a possibility to find collectability and you have the same with postage stamps. Further it gives other dating or identification help that we can use. It is not possible to go wrong by going after the stampings because if I would find a variation that is not done on purpose then it is a production variation. Both are helpful in deed. The funny thing with postage stamps is that you find them with variations that collectors enjoy. Some are centered strange. On the tang of the knives you have the same issue and it can be very interesting to study. I would not expect that the Wenger secrets if still possible to find would explain such details because it would compromise the products. We cannot rule out the possibility that a foreign manufacturer would try to copy anyhow. I do feel I am on to something interesting with my research on it. It is very fun! It takes time too. More is that differences between batches are interesting. Batches of blades made at a certain time in history may have differences compared to other batches that are close in years. I like Postage stamps and this opened up some more possibilities for me. 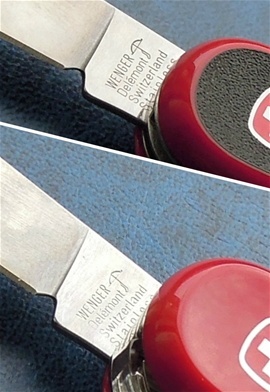 The name Wenger on a blade is important because it is the maker mark and signature. It is the name that carry the quality and identification. On the right picture the top knife is a 2013 made knives with a very small difference towards the 2013 Ap Snow above. On the right picture the black New Ranger is close to the Pink in year but not completely. There is a big difference and it cannot be from the same module. On the picture to the right are two 85mm Wenger knives that are from different years. 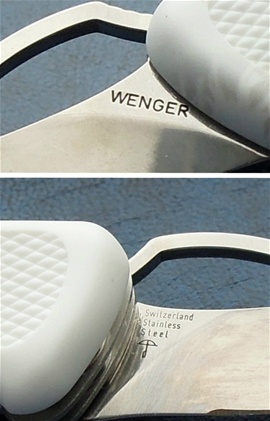 Wenger changed the grind or blade design towards the shank with the new company developments 2004-2007. With variations also here to mention blade grind as one date that vary. Then they changed it more towards the top one again at a later date. The two stamps looks very similar but i can tell that absoluetly it is impossible that the two are from the same module. I have used a magnifier to see. Not only is the stamp different compared to eachother the polish or finish is a bit different on the steel as well. The Wenger stamps are very difficult to picture and it is difficult to get the same light on both that is similar. Typically the stainless designation is a bit hidden in open position by the aluminum dividers or liners. It opens when moving the blade at different points. In general these stamps used are very similar looking and very precise. Usually it is only production variations that makes the difference with all the steps with dimension tolerances and precision. Typically with Wenger knives you also have variations in the spring tension. The use of a rivited design and sandvich assembly is not only extreme to master it is a sciense. I really like Wenger knives! I can spice the 85mm information up some. As you know the special angle grind towards the tang on the 85mm blades have variations in dates. Some are actually also before the 2004. There are variations on the angle itself as well. The typical one you see on the picture to the right today is the type you see 2004-2011. I have noticed that this particular angle that I have mentioned in earlier articles and today can be found alternated. There are knives that do not have this during 2004-2011 and there knives with it. I will explain later why I am into all these details. Next I would like to mention again is the tang stamp itself on this angled grind design. It is not from the same module. At 2012 this angled grind is less used and it marks a date for you guys to use as a dating tool. The reason for why I am into all these details is to learn more about the production, changes, and variations and to get knowledge. All Wenger knives are collectable in my opinion. I am sure some are more collectable and only time will tell. The stamp on the angled grind blade is not from the same module because I have checked with similar knives. Wenger used a different module that is almost completely the same at first eye. It is not the same. Both are for sure 100% Wenger it is just that this is different. Could I therefore say that Wenger changed a step in the production and that this stamp may reappear? Probably both yes. I have learned for sure that with the different angled grind there is a different tang stamp even if it is one year between the two on the picture. The other is from 2012. The reason for why I post some 85mm information is that some changes may be similar on the 130mm with stampings and so on. Changes that said. Wenger continued production during 2013 and it is one important year with every aspect. Another important thing to remember is that some chages happens more early like mentioned. Here are two 2012 made knives with the 130mm New Ranger category main blade. The stampings are different compared to the ones with one hand opening blade. It may be that these two 2012 blades are from the same batch or that the module for the stampings is the same. Both are the New Ranger 55 construction with different handle materials. I recommend looking on the stampings on your knives because it is possible to learn something about the production. This may be about the production variations that may or may not be unavoidable for example. This you can use to compare other knives and then you may rule out some questions. Have it in mind and compare to 2013 for example. Only one year in between may have new changes. I am sure that in general Wenger make a stamp and that the small variations I am into may be a factor that is not so important. What is important is to know the different modules even if it is minor differences. I can come to use later on. To study Wenger is fun and interesting. Typically it is so that the same type of construction will be the same even with different handle scales. The functions are the same and the materials. Typically it is so that there are little differences between the same batch. There may be differences between years very close to each other. The evolution on the knives with categories shows differences in design of functions. Wenger use a good selection of stainless steel with the properties that the company Philosophy incorporates into them. The evolution on the products that is difficult to see at first eye can be much more difficult to intrepid. Production variations can be because of polishing machines and numerous other factors that a production may yield. It would be very interesting to discover the more unknown differences. I can clearly see steps that are different with the tang stamps or markings found on the blades. 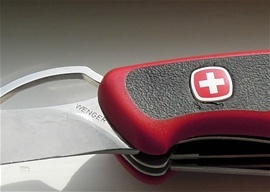 There is a constant change with Swiss Army Knives. On the right picture are two 11 2013 made New Ranger knives, one 50 and one 79. Both AP Snow handle scaled. The knives and batches must be from the same I do believe so far. 11 2013 marks a very important date with Wenger knives. It is also so that it would be strange if it is not so that during periods of time the Company made many knife blades and that from time to time an earlier made knife may be attached on a later date. This is a factor that from looking on knives may be the case. As I mentioned there is only positive details coming out from studying the markings and stampings used. If it is not deliberate then it is a production variation or simply an earlier batch knife used later and so on. There are no doubt that knives with strange stamping or mistakes for example also may increase collectability for it is simply very rare that this happen. Deliberate or not! I have seen a few thousand stampings over the years. 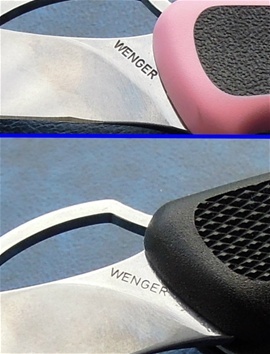 I mentioned that the typical Wenger markings are very precise in design and form. 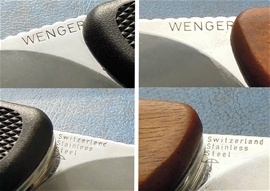 I am not completely sure what stamping methods Wenger use every time. If it is metal modules then they get worn and that is a factor I will mention. It is rare to find damaged markings during the most modern period. It must be the case that The Company quality control put much effort and quality into making sure about this. I mentioned some that it is the address, signature, quality image and product. It is the maker name that is very important to remember. The Swiss symbols are regulated by laws and regulations and that there are changes done from time to time. Some changes like the study are about deliberate changes done to protect the product and the quality image continuation. If you look on the picture above with the two New Ranger knives the 50 and 79 AP Snow there is one difference you need to know. The backside grind of the blade is a bit different and that I intrepid so: Even if a blade is from the same batch if it so then in the production there are tolerances and production variation of the grinding machines. This means that there may be differences in the same batch. It is the stamp itself that is most important and the placing of it as well. I recommend using a magnifier and study the letters and design of the stamp itself. There are obvious differences from time to time that tell me that even if the stamping process will have production variation that are unavoidable and the depth of the letter included it is not possible that they can be so different under a magnifier glass. I believe it is the same batch if not it is very close and the stamp module is the same. It is typical all the way during this Company history that you have small differences between them. If you place the knives besides each other you can find small differences. The corkscrew is one and the tang of it may have some length differences between them outside the normal evolution. Remember the emblems and tang stamps because there are typicality’s also here. Outside the usual evolution!